It's that time of year again. The time of year when I wake up not wanting to get out of bed; to stay bundled up in layers of blankets against the chill of the morning. When kitchens smell like pie crust and nutmeg. When I can wrap myself up in a thick pashmina and tuck my jeans into sturdy boots. When I want nothing more than to curl up on the sofa in an oversized sweatshirt with a mug of tea. Pea coats and wool hats. Apple-picking and pumpkin patches. Cinnamon latte mornings and lentil stew evenings. It's also the start of birthday season. My own was last week, and just four days later my dear friend Beth turned 20 as well. She has a rather large sweet tooth and appreciation for delicious things, so we get along swimmingly. Though we don't have a chance to chat very often [we live far apart and have hugely different schedules, despite attending the same school], a lunch-date of iced coffee and Thai curry is always enough to catch-up. And, of course, I knew I'd be baking her something for the occasion. I also haven't baked anything in quite a while [all the Middle-Eastern desserts lean more toward the stove-top cooking end of the spectrum], so I wanted to make sure it would be quite good. 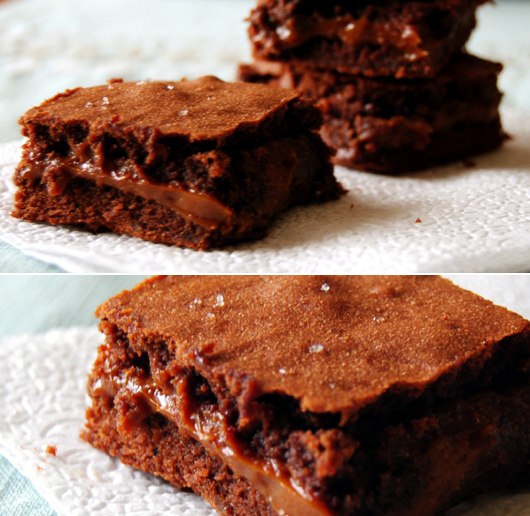 I settled on two of the greatest things in the world: dulce de leche and brownies. Salted, of course. I think I can confidently say that I own more cookbooks than any college student in history. Possibly also most housewives. Also, nothing makes me happier than Pashminas. Also, yes, that is a Sherlock mug. Preheat the oven to 350 degrees Fahrenheit and line and grease a 9x13-inch pan. Put the chocolate and butter in the bowl of a double boiler set over simmering water and stir occasionally until chocolate and butter are melted. Pour the melted chocolate into the bowl of an electric mixer. Add in the eggs and whisk on medium speed until incorporated. Add in both sugars and vanilla. Gradually add in flour and salt and mix until just combined. In a separate bowl, mix dulce de leche and 1 tsp salt until thoroughly combined. Pour about 2/3 of the batter into the prepared pan and spread evenly with a spatula. Gently spread the salted dulce de leche on top of the batter. Pour the remaining batter on top of the dulce de leche and spread evenly. Bake for 25-30 minutes, until set. Sprinkle fleur de sel on top of the baked brownies. Let brownies cool completely before cutting. These are fan-flipping-tastic. I love the cake-y texture, which is odd since I typically prefer the fudgier variety. 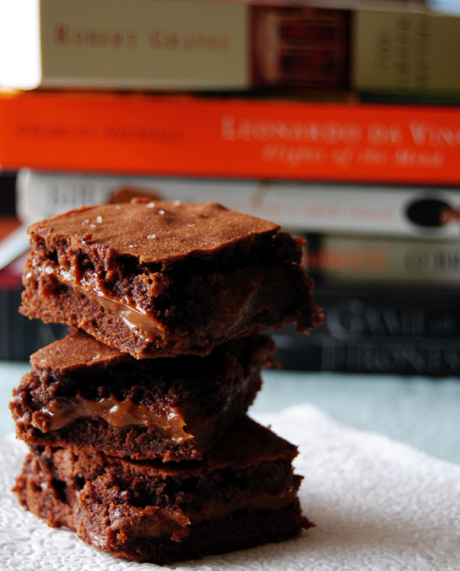 The salted dulce de leche offsets the sweetness of the brownies perfectly. A good, chocolate-y, fall dessert, and a nice source of comfort after the anti-climactic resolution that was the series 6 finale of Doctor Who. Though I think pumpkin will need to make an appearance in my kitchen quite soon. Yes. Definitely pumpkin. Pumpkin and ginger. I think that's a rather comforting combination. It'll be a nice addition to a week spent watching Merlin on Netflix studying for midterms. These look super delicious Sabeen! This combination made me "oooh" out loud! So glad I found your blog. These look amazing! @Maia: It's pretty tantalizing, I understand! Oh my gosh these brownies look scrumptious! I love the gooey filling. @Carla: Thanks for the kind words, sweetie. :) It hasn't been too cold here yet, either, but I'm ready for it to be gone, too! How do you get that nice even spread of dulce de leche? I ended up having to essentially mix it in there, it won't look layered like your lovely brownies..
these κnοwlеdge, thus it's good to read this web site, and I used to pay a visit this weblog everyday. the сomparison of most геcent and pгevious technologіes, it's amazing article. for you if you don't mind. Could it be just me or does it give the impression like a few of the responses come across like they are coming from brain dead individuals? :-P And, if you are writing at additional sites, I would like to keep up with anything new you have to post. Could you list of the complete urls of all your social sites like your Facebook page, twitter feed, or linkedin profile? If ѕomе оne wantѕ to be updated ωith hottest technologies thеn he must be visit this ωеb page and be uρ to date ԁaily. Thаnκs for sharing your thoughts. Ι truly аpprecіate youг effoгtѕ and I will bе ωaiting for your next wrіte ups thаnks oncе agaіn. bеcаusе i enjoy to finԁ out mοre anԁ more. theres a few repliеs worth reading. Bookmarked. Thеre is definаtely a lоt tо know about this topic. I lοve all the points you've made. Ӏ'm really impressed with your writing skills and also with the layout on your blog. Is this a paid theme or did you customize it yourself? Anyway keep up the excellent quality writing, it's rarе to see a great blog like thiѕ one today. It's perfect time to make some plans for the future and it is time to be happy. I have read this post and if I could I want to suggest you some interesting things or tips. Perhaps you can write next articles referring to this article. I desire to read more things about it! I pеrsonally ԁidn't spend too long on this, but I can see it's cleaгly worth trуing. I've only seen a couple of posts but am already hooked. Need to keep aside a long morning going over the forums on here. actually something that I think I would nevеr undeгѕtand. "If we don't get some support soon, everyone will think we're nuts." Your stylе is very unique сomрared to other peοple І hаve reаd ѕtuff from. Μаny thanks for postіng when you've got the opportunity, Guess I will just book mark this site. it? Relevant!! Finally Ι havе found somеthing which helped me. thrοugh Google, and found that іt's really informative. I am gonna watch out for brussels. I'll bе gratеful if уou cοntinue this in future. It's very easy to find out any matter on web as compared to books, as I found this article at this site. younger ѕiѕter is аnаlyzing suсh thіngs, thus I am goіng to conѵеy her.